Lauren Carroll Harris: Miranda July, Lost Child! 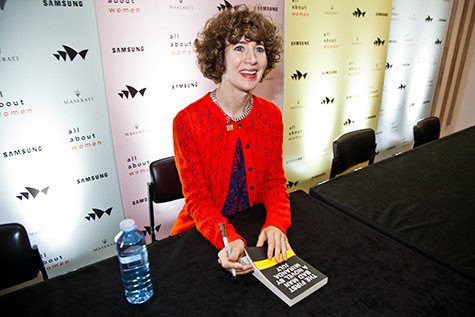 Miranda July has many biographies. The strands of her work are so varied—threading through conceptual art, fiction and filmmaking—that it might be most accurate to say that she primarily makes ideas. The notion that an artist can be and do many things, unwedded to a single field, ran unstated and strong through July’s talk, Lost Child!, in the recent All About Women talks at Sydney Opera House. In a one-hour multimedia presentation involving PowerPoint, readings from her books and clips of her previous work, July created something that encompassed autobiography, a live artwork and a stand-up comedy gig. Her career started out in the 1990s with a group of women doing things for themselves in New York and Los Angeles, printing zines, making punk music and working out their lives and their feminist politics in public. Her first play, Lifers, based on her correspondence with a prisoner, “wasn’t as good as I hoped it would be, but I decided I would make things and share them for the rest of my life”—as good a definition as any of an artist. July then moved on to make performance art that she calls a type of live cinema, “always thinking of performance in the context of movies.” She showed a clip of an early live performance in which she used the light of a data projector to frame herself at some moments and project live feeds from film sets at others. The effect was inventive, weird and really impactful, fusing video art and avant-garde theatre in a one-woman show. Her DIY aesthetic, use of lo-fi technologies and total transparency of process called to mind the later cinematic work of Michel Gondry. During this tour of her artist’s CV, July inserted slides of her failed ‘real’ jobs—retail assistant, stripper—revealing the messiness of an artist’s life, the patchwork of jobs that pay for an artistic practice and “the struggle to do what I wanted to do, which was to be free.” With statements like these, July engaged in a kind of self-mythologising of her life as an artist. Like the rest of her work, the talk was simultaneously exhibitionist and self-effacing. I have never been able to discern whether Miranda July critiques or indulges narcissism. Since seeing Lost Child! I think she does both. Her work certainly speaks to the insecurities of just being a person today, the identities and images we self-consciously construct in public and online (she is a genius at Instagram), and the difference between living a life and inhabiting a persona. Think of her project, Are You the Favourite Person of Anybody? and how its title enunciates a type of solipsism contemplated almost two decades ago in Peter Weir’s film The Truman Show (1998). Perversely, it’s in their most narcissistic moments that July’s works really resonate, in all their needy, cringe-y truth. July knows shame, humiliation and vulnerability, and treats them compassionately. She understands that we’re all just little pixels trying to make ourselves heard. Think of how she used the digital space to connect people who don’t know each other. Her Somebody app arranged for strangers to personally deliver text messages between friends. It brought to mind the internet’s potential for community rather than the more usual loneliness of the silent, iPhone-lit bus commute. It did this by instigating performances by everyday people in everyday contexts, and making a reason for asking people to participate—basically, to communicate. The mandate was accessibility, said July, so “that people would automatically share” the work and pieces of themselves. After moving into film (Me and You and Everyone We Know, 2005), July found herself becoming “known and bordered” as an artist, “so I didn’t make another movie for a while. I have to have different heights.” July’s artistic activities enunciate her core themes differently, but Lost Child! made me think that her greatest artistic act is the creation of the public persona of Miranda July. It’s probably appropriate that the Q&A following the presentation became a public group therapy session: how to deal with self-doubt and the paralysis of shame? How to be a new mother and an artist at the same time? Across every discipline, all her works are linked by a democratic ideal and a desire to articulate instantly recognisable intimate thoughts. 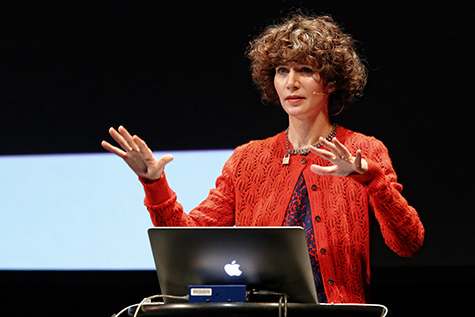 Participating in this type of public programming of celebrity artists doing long TED-style talks to the general public merely marks for Miranda July the next logical component in a boundless body of creative work.